If you're dying to get your hands on a Windows 8 tablet, right now for $2,000 or more on eBay you can pick up several Samsung Series 7 700T tablets running Windows 8. The one-panel slate was handed out for free to all 5,000 developers who attended Microsoft's recent BUILD conference. Now, at least four enterprising conference attendees are looking to profit off Microsoft's largesse. With all the excitement around Windows 8 right now, these tablets are likely to be popular items. In fact, one was sold while this article was being written. Nevertheless, you still have time to check these tablets out if you're interested. At the time of this writing, only one of the four Windows 8 tablets included a "Buy It Now" option (for the ridiculous price of $3,500). The others were all being auctioned to the highest bidder, with minimum bids ranging from $2,000 to $2,300 depending on the seller. The Samsung tablets were first discovered on eBay by WinRumors. So what do you get for a minimum of $2,000? Well, for starters you'll get a piece of hardware that is similar to what is scheduled to hit store shelves October 2 -- albeit running Windows 7. On top of that, the base 700T running Windows 7 will retail for a suggested $1,100, nearly half what you'd pay on eBay. So why not just wait a few weeks, buy the Windows 7 tablet and download and install the Windows 8 developer preview for free directly from Microsoft? Well, it's not clear how much tweaking Samsung and Microsoft did to get Windows 8 running on Samsung's reference model, so perhaps it's worth it to overpay for this version of Samsung's Windows tablet. But trying to find a bargain on this device is hardly the point. It's the first tablet you'll find that comes preloaded with Windows 8. And, as any technology geek knows, it's always fun to be the first on your block with a flashy new toy. The Samsung Windows 8 tablets for sale on eBay feature an 11.6-inch display with 1366-by-768 resolution, 1.6 GHz Intel Core i5-2467M Sandy Bridge processor, 4GB RAM, 64GB hard drive, USB port, microSD, and HDMI port. 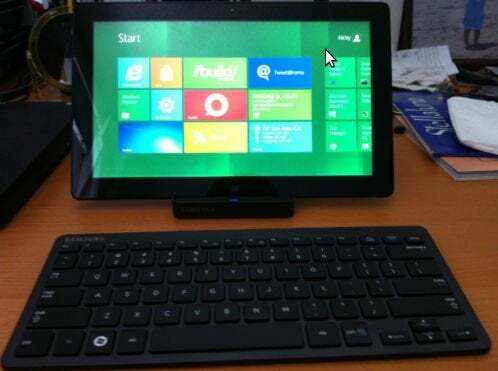 The Windows 8 tablets on eBay also come with a Bluetooth keyboard, a dock that includes USB, HDMI and Ethernet ports, and a touch pen. Most sellers, but not all, are offering the free 12 month, 2GB-per-month AT&T data plan that came with the device. Assuming you're lucky enough to get your hands on Samsung's Windows 8 tablet, you'll have a lot to look forward to, but there are also some serious downsides, according to PCWorld's hands-on look at the Windows 8 700T. You can expect image and text rendering to be better than the iPad and Android tablets such as the Galaxy Tab 10.1. You also get to use Microsoft's intuitive and responsive Metro-style interface, inspired by Windows Phone 7. But the 700T is much heavier than other tablets, weighing in at about 2 pounds, compared to the 1.35-pound 3G iPad. You can also expect a lot of noise from the device's fan as it tries to cool down what is essentially a PC slapped into a one-panel slate form factor. And you need to keep the charger nearby as current battery life for the device is around 2.5 to 3 hours. The good news, however, is that Microsoft plans to continually update Windows 8 during the developer preview phase, so battery life and other performance issues may change in the coming weeks. Samsung's 700T running Windows 8 sounds like an interesting device to own, but is it worth the $2,000 right now? Probably not, but it's fun to check it out anyway. If you want to give Windows 8 a try right now but can't stomach the Samsung tablet's price, you can download the Windows 8 developer preview from Microsoft for free.